Ride horses or off-road vehicles? 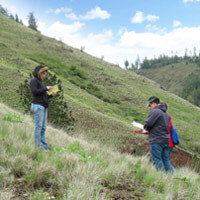 Pursue an exciting career path in land conservation? Explore profiles of Rangeland Management Specialists who have made their careers working on landscapes they love. To become a Range Technician you need at least 1 year of study that includes at least 6 semester hours of courses such as range management or conservation, agriculture, forestry, wildlife management, engineering, biology, mathematics, or other natural or physical sciences. Most Rangeland Management jobs require a four year college degree. View the list of schools offering rangeland programs in your state or province. The creation of this Rangeland Recruitment Webpage was made possible by USDA Higher Education Challenge Grant No. 2010-38411-21370 "Repositioning Rangeland Education for a Changing World." See what current students and recent rangeland graduates are doing in the field. Rangeland managers secure careers to manage and conserve rangelands with a variety of private individuals or organizations and government agencies. Federal land management agencies such as the Bureau of Land Management, Natural Resources Conservation Service, U.S. Forest Service, Department of Defense, and the National Park Service. State agencies charged with managing publicly owned lands, such as state departments of agriculture, lands, wildlife, parks, or recreation. The Private Sector, such as private landowners, ranches, ecological consulting firms, landscaping companies, and tribal agencies. Non-governmental conservation organizations including The Nature Conservancy, Pheasants Forever, Rocky Mountain Elk Foundation and local conservation groups and land trusts. Find out more about potential employers.